In 1868 two German Immigrants Jacob Gimlich and John White purchased a small brewery from Michael Benson in Pittsfield, Massachusetts. The years that followed the brewery changed names a few times starting with Jacob Gimlich & John White in 1868. In 1878 the brewery became known as Gimlich, White & Co, and in 1882 becoming just Gimlich & White. It wasn’t until 1892 that the brewery became the Berkshire Brewing Association. The brewery produced beers such as, Greylock Ale, Mannheimer Lager, Lenox Half Stock Ale, Berkshire Lager, Berkshire Ale, and Superior Old Porter. In addition to beer, Mineral Water, Soda, and Malt Extracts were also produced. The brewery was a great success producing 75,000 barrels a year and distributed all over the northeast and as far south as the Carolinas. The brewery closed in 1919 due to prohibition. All we have left from this era in brewing history are the remaining pieces of breweriana still in existence with most being over 100 years old. Photo is a Gimlich & White glass . I seen this glass on Ebay or Breweriana.com years ago but didn't bid because the price went over $400 at the time. I wish I had because I have never seen another since. Gimlich & White brewery, located on Railroad and Onata streets, is the largest in Western Massachusetts. In 1877 the business was started in a small way, with capacity for brewing 500 barrels per year. This business has since steadily increased, so that in 1880 they built the present large five-story brick building, 40x80 feet, which is surrounded by the necessary buildings for ice, storage, etc., having the capacity for brewing 16,000 barrels per year, giving employment to sixteen men. Mr. Gimlich represented this district in the legislature in 1883-84. Berkshire Brewing Association votes to brew beer no longer, but turn to soft drinks because of prohibition. Officers President David J Gimlich, vice president and secretary John A. White, treasurer George H White, directors, George H White, John A White, Karl O Cyrus, D J Gimlich. John White and Jacob Gimlich bought the plant of Michael Benson (1868). The daily output was then six barrels. The business grew to a capacity of 75,000 barrels a year. Sixty hands were employed and the product was sent to many states, including the Carolinas. The brewery, the only one within a radius of 60 miles, was a thriving industry and made its owners rich." Association which had a big, spread-out plant at the corner of Columbus Avenue and North John Street. When Prohibition went into effect in 1919, the brewery employed more than 100 men, and averaged 325 barrels of beer a day. the Carolinas. Between 1910 and 1920, the firm paid the federal government some $1 million in taxes. Special brews were, Lenox Half Stock Ale, Greylock Ale, Mannheimer Lager and India Pale Ale. sold stock (the big brew house had been built in 1890) and the firm enjoyed a monopoly as the only brewery within 50 miles of Pittsfield. After Prohibition, most of the buildings were torn down, the equipment dismantled and sold. The Siegel Furniture Co. occupied the old bottling works building, now the Warehouse Furniture Outlet, 352 Columbus Ave., owned by Irving Siegel. And this building may be torn down, too, under the Pittsfield Redevelopment Authority program. Gimlich & White are storing immense quantities of ice from Silver Lake. Twenty teams are drawing the cakes and 40 men are cutting and stacking." Old wooden building used as brewery for many years by Gimlich & White and located in rear of newer brick brewery, torn down." 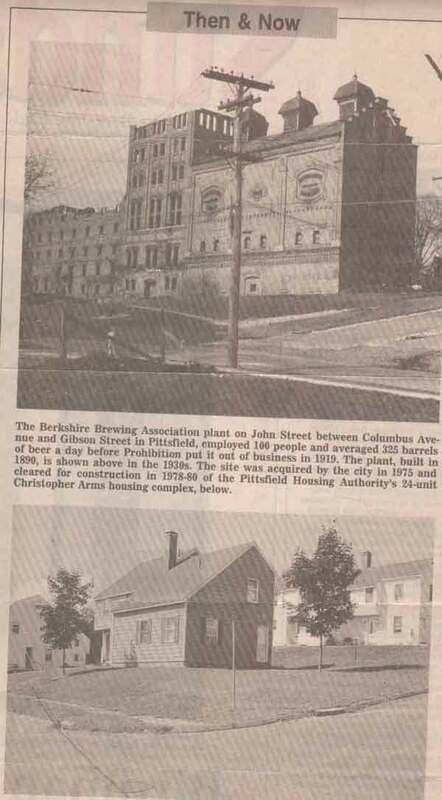 Clipping of the Then & Now Berkshire Brewing Association - Thanks to Beckie for the photo. Jacob Gimlich, born in Weisenheim, Bavaria, October 4, 1845, married Louisa Ellen, daughter of the late William Feige of Pittsfield...Soon after coming to Pittsfield with his father, Mr. Gimlich entered the Taconic woolen mill and learned designing, and was offered a good position in that department. He preferred, however, to enter into business with his brother-in-law, John White, and the two purchased a small brewery in which they began operations on a small scale, and now they are owners of a mammoth establishment two hundred feet long, operated under the corporate title of Berkshire Brewing Association with a capital stock of one hundred thousand dollars, and a capacity of seventy thousand barrels with a gratifying yearly increase of output." According to Images of America Pittsfield, by Susan Eisley, Published 2001 Arcadia Publishing, page 64, "The Berkshire Brewing Association, c. 1905. 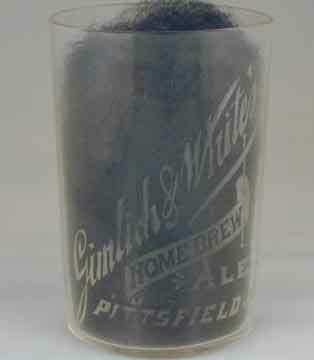 Two German immigrants, Jacob Gimlich and John White, purchased a small brewery in Pittsfield in 1868. Under their guidance the business grew to produce 325 barrels of beer each day. Incorporated in 1892 under the name Berkshire Brewing Association, the brewery shipped its product all over the United States. Prohibition put it out of business in 1919." NOTE: Some of the products produced by Berkshire Brewing Association include: Mannheimer Lager Beer, Berkshire Pure Malt Extract, Lenox Half Stock Ale, and Berkshire Pale Ale. 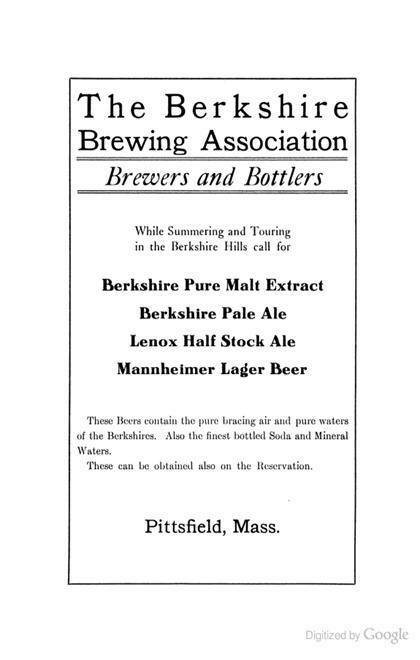 THE BERKSHIRE BREWING ASSOCIATION, manufacturing for sale and selling, buying, &c.. all kinds of ales, soda waters, &c , Лч1. ; principal oflico, Pittslield, Massachusetts; charter issued, July t>, 1892; expires, May 1, 1942 ; corporators, Jacob Gimlich,. John White, Fred C. White, George H. White, David J. Gim- lich, all of Pittstield, Massachusetts; capital subscribed, $21,000; amount paid in, $2,100; capital authorized, 8000,000; par value shares, S100. "Gimlich & White, brewers, added 6 tanks holding 5,4000 Gallons"
"Gimlich & White broke ground at Pittsfield for a new brew house, of brick, four stories high"
"Gimlich & White presented each of the married men employed in their brewery with a Thanksgiving turkey"
"July 16th. Tel. call 2.16 p. m., to dwelling house 132 Columbus Ave., owned by Gimlich & White. Cause, chimney fire. No damage"
Gimlich & White, On Railroad and Onata streets, was first established in 1877. The business has steadily increased from the beginning, and the establishment is now the largest of its kind in Western Massachusetts. In 1880, the business demanding increased facilities, the present brewery was erected. It is a five story brick structure, forty by eighty feet, with a capacity of brewing 16,000 barrels per year. About 16 men are employed. Photo Of John A. 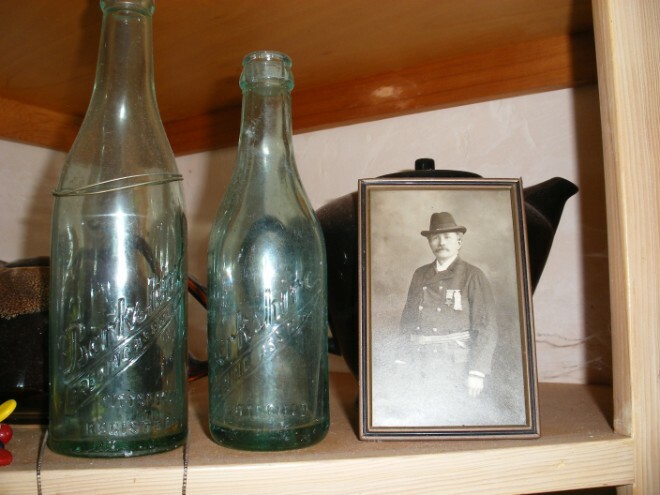 White In Civil War Uniform next to two Berkshire Brewing Association Bottles. Thanks to Guy White, The Great Great grandson Of John White For The Photo.